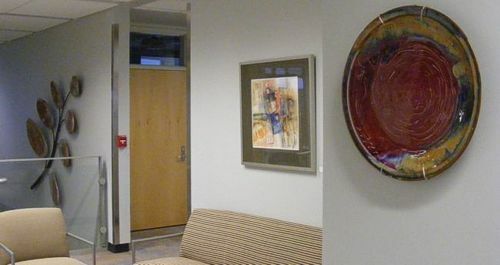 Artists’ Own co-operative gallery is making artwork available to some business and institutional customers on a leasing basis. We lease certain artworks - especially larger ones - on 3, 6, or 12 months agreements, with a charge of 1/15 (one-fifteenth) of the retail value per artwork per month. At the end of the lease period, any payments can be applied to the purchase of the artwork, or the artwork can be returned, and new artwork may be chosen to replace it. As an added value we are happy to install the artwork for a nominal fee, or you can install it with our instructions. 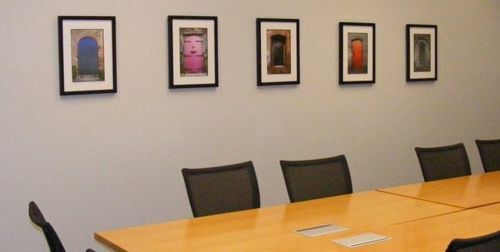 In this way your place of work can have a turnover of artworks for a reasonable cost. If at the end of the lease period you decide you like some of the artworks enough to purchase them, your lease fees apply toward the cost of those artworks. For example, Artists’ Own has been working closely with Purdue’s College of Engineering as they made their transition to the new Armstrong Hall of Engineering. They wanted larger, innovative, and contemporary work to grace their ample wall spaces over the two upper floors. We worked with them to find art they liked, that complement the offices and workspaces. Today when visitors enter Armstrong Hall they are greeted with exciting visual art, which reinforces the College of Engineering’s campaign to encourage innovation, cooperation, diversity, and discovery. They have also commissioned a few "showstoppers" which should be ready before the fall semester. Artists Own has designed a leasing schedule that allows them to "have" the artworks, without the need to own them long term. This allows them to avoid the maintenance and conservation responsibilities. This program with Armstrong Hall has been so successful that they have commissioned a few site-specific artworks for outright purchase. If this new program is of interest, for your office or home, please contact Artists’ Own at lease@artists-own.com.